Rebecca Ireland’s debut album, ‘Love and Sticky Tape’ is a rhythmic reflection of the artist's life journey to date, taking the listener to places words often fail to describe. ‘Love and Sticky Tape’ is as delicate as it is powerful and gutsy. The soul driven grooves allow the songs movement and colour, with Ireland's melodic vocals skimming across the waters of folk, rock and funk. The album was recorded at Lucky Boy Studios with long time Melbourne producer and veteran session musician, Geoff Wright, who’s Hammond and slide guitar adds a soul sensibility to the record. Preserving the authenticity of Ireland's influences and sound, the entire album was recorded and mixed on a 24 track analogue desk. "We wanted to record this album the same way all the great old records were made" say Rebecca. "Geoff has an amazing collection of vintage analogue recording gear. Most of the recordings are first takes." 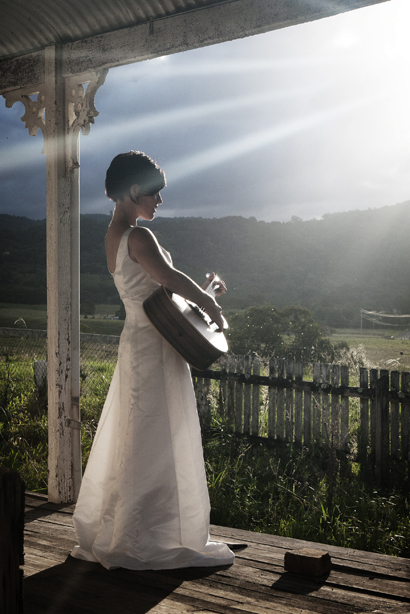 Drummer Pete Wilkins (Blue King Brown, Red Eyes) and bassist, Thierry Fossmalle (The Whitlams, Grace Knight) have add their instrumentation and interpretation of Rebecca’s songs, helping to shape the final sound of the album. Ireland's intimate vocals and rhythmic guitar grooves transport you into her world, creating something beautiful with all the “Love and Sticky Tape” a girl can muster! “Love is everything, its indefinable. All its moving facets make up our moments. Sticky tape is the stuff that strings the stories of our lives together. The songs on this album are little pieces of me,” says Ireland. ‘She’s Apples’ is an uplifting song about the ripeness of things and how our lives fall into place” says Ireland, while ‘Get Lost’ explores longing, love and fate. ‘Grandmother’ is inspired by stories about my great grandmother, a Cherokee Native American who drank black tea, smoked a pipe and supported women as a traditional midwife. This song takes me to my roots and explores our sense of belonging and the inherent wisdom within each of us" says Ireland. Rebecca Ireland lives on the north coast of New South Wales. Love and Sticky Tape is available through Vitamin Records.